I’m the kind of person who likes to crawl into their man-cave when sick. The down side of this is that when the fridge is empty, the only path to sustenance is to drag one’s self from said cave to either the kitchen or the grocery store. I decided that combing my hair would be more work than chopping veggies, so I opted for culinary duty. Plus, all those market veggies had come to the party last Saturday and had yet to get a worthy invitation for a good dance dish. Now, I’m not normally a broth-based soup person. I like it blended or stewed, but not with bits of things floating in admittedly tasty almost-water. However, two weeks into a hacking cough, hot water with honey was getting pretty boring (even if the menthol cough drops had deadened most of my taste buds) and I wanted something with enough liquid that I could dip in for a ladle or two of hot liquid in between meals. 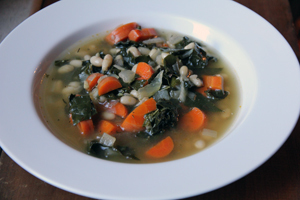 As I had fresh navy beans, kale, and even a parmesan cheese rind on hand (I really think that part is essential to a broth worth sipping–do not skip! ), I made a small vat of this soup, making it a vegetarian version by skipping the sausage and substituting vegetable stock for all liquid (though at less volume than indicated in the recipe–probably about 7 cups total). It was super tasty and perhaps the most effective medicine I’ve tried so far. Plus, half went into the freezer and I’m now prepared for the next time I am either too sick or, more likely, just too tired to cook. I was also out of bread, so this morning I fired up Sir Mix-a-Lot again. B has asked me to work on a 100% whole wheat loaf for him, and since my parents had brought me a bag of whole wheat flour from a local Ohio source, I decided to give this King Arthur version a try. As this flour was a pretty course grind, I erred on the side of caution and did half-and-half with some white unbleached bread flour, and kicked in some vital wheat gluten for good measure. 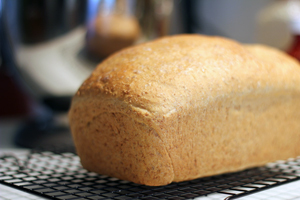 Since I wanted this to be the simplest (read: neatest) making of bread ever, I vowed to only do a mixer knead–not a pinch of flour on the counter. In the end, the dough was beautiful and the rise amazing. I think this household is primed to go 100% on the next venture! Keep safe and stay healthy out there, everyone! I’m sure trying to leverage a holiday bird one-handed is no fun at all and you certainly don’t want to get caught by family members coughing on the turkey. I am so bad about that! It’s one of those things that as soon as I actually get a freakin’ ziplock out of the pantry and start it, I’m sure it will be an easy habit to keep, but why is the starting of a new routine always so hard? Especially since I can’t compost on my small urban homestead here, stock is the least I could do with my scraps.